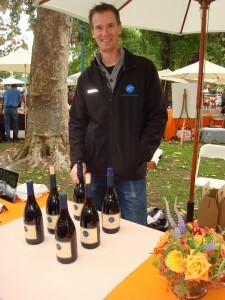 We had a great time pouring for the third year in a row at Pinot on the River which was right on the main plaza in Healdsburg. 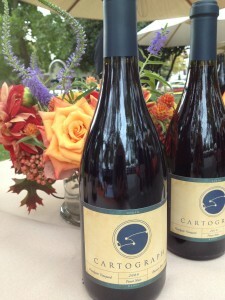 The weather was gorgeous, the crowd was interesting and inquisitive, and the wines showed beautifully. Alan and I decided to pour the newly released 2010 Floodgate Vineyard Pinot noir and the 2009 Floodgate Vineyard Pinot noir side by side. The 2010 vineyard designate has three Pinot clones – 667, Pommard, and 828. Given the unusually cool spring and summer, we picked the fruit two weeks later than the 2009 Floodgate Vineyard Pinot noir. Given that we picked the 2010 at lower sugar levels and higher acidity than 2009, this wine is racy and vibrant and has a delicateness that is very different than the opulent lushness of the 2009. The 2009 Floodgate Pinot had a much warmer growing season and is four clones of Pinot – 777, 667, 828, and Pommard. Also, given that it is a year older, the 2009 is showing more of the earthy soul that defines Floodgate Vineyard. It was really fun to see people’s reactions to both wines and to talk through how the wines are different and simultaneously similar. Previous post: Celebrating Vintage Variations – Nerd Alert! Next post: What are you having for Thanksgiving?